Buying stocks with defensive strategy is one of the strategy smart investors follow in current stock market scenario where market's future direction is unclear. 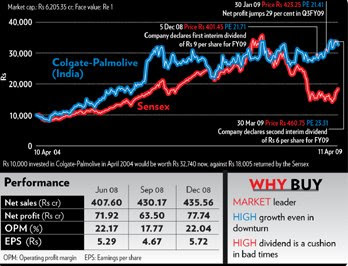 Colgate Palmolive is one such stock people love to buy as part of defensive stock buying. In the first three quarters of financial year 2009 (FY09), Colgate-Palmolive’s product categories in oral dental care maintained their leadership position. In toothpastes, for example, a major revenue contributing segment, the company maintained a market share of 49.6 per cent. The segment’s volumes grew consistently at over 10 per cent year-on-year (y-o-y) in the three quarters, with December 2008-ended quarter being particularly robust at 14 per cent. In the same three quarters, the toothbrush category saw an exceptional growth of over 30 per cent, with Colgate-Palm-olive’s market share in the segment moving up by 2.8 per cent to 38 per cent. Other categories such as personal and household care continued to add to volume growth. The company has maintained its position and profits in an increasingly competitive market by focusing on the three major drivers of dental care products—rise in per capita consumption, support of dental professionals and increase in sales through enhanced distribution—as a part of its longtime strategy of building its presence. The company’s financials have grown slowly but steadily over the last 10 years. Sales grew at a compounded annual growth rate of 4.5 per cent but profits grew at 17 per cent. This was due to continuous expansion in margins as a result of cost control and focus on efficiency across the organisation. In the first three quarters of FY09 too, profits rose more than sales. For example, Q3 y-o-y growth in sales was 13.25 per cent and in profits 28.60 per cent. This, again, was due to the operating margin going up by 54 basis points in Q3FY09 compared to the corresponding quarter last year. In fact, Colgate-Palmolive’s operating margin is among the highest in the FMCG sector. The cost of raw materials as a percentage of net sales has remained constant over the last four quarters. The declining cost of commodities is yet to be reflected fully in the cost figures, which could help in margin expansion. As a result of this and the tax benefits the company enjoys for its production facility at Baddi, Himachal Pradesh, its margin could remain high in the coming quarters. The company is almost debt-free, with small borrowings of Rs 4.69 crore and a cash balance of Rs 144.26 crore. Colgate-Palmolive’s scrip was trading 23 times its trailing 12 months’ earnings in April 2008. Even after gaining 22 per cent in the past year, its shares are trading at the same PE level (the current figure is 23.35). This is because it has also maintained a high growth in earnings per share (EPS). The stock may look expensive, but isn’t. Taking last five years’ profit growth, the scrip’s PEG (price-to-earning by growth) ratio, which discounts a company’s growth, is 1.09. If the PEG ratio is below (or just about) one, the stock is fairly priced. Further, the stock’s dividend yield is 4.89 per cent and it has a long dividend history. So, we expect the scrip to ensure a regular income as well as capital appreciation.